It was another good day for Brett Love. His Ratings Selection (non account) that we shared in yesterday’s free tip mail, Chica Buena won at 11/10 SP and his main service bet won at 9/1 advised price. Today I have another one for you that is too short to be an official bet but is top rated on Brett’s ratings. Personally I like to bet short ones with a higher strike rate. Brett’s secret ratings have really amazed us over the last few months while he has been proofing them and since they went live to his members. Since June 23rd this year the Ratings have had a strike rate of 27% and a total of £145 has been staked with a profit of £133.72. That’s an ROI of 92.22%. Just a £10 stake on each would have provided a profit of £1,450 at Betfair SP after commission. I have never seen anything before that has made an ROI this big at Betfair SP. I recommend that you get involved while there are still places. Once you join up your welcome mail will explain how to get the Ratings selections. 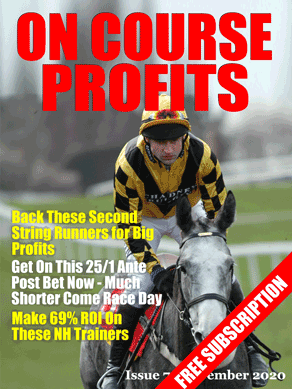 You can try his regular service (31% ROI) and get his Ratings selections included for just £9.99 for your first month.